ESPN undergoes a major layoff; mobile and desktop advertising surpassed TV; This Week in Fake News; Radio Shack goes out in style; Facebook's associated apps) are approaching the 1B mark; Twitter outperforms in earnings and followers; LinkedIn's Matched Audiences will be a boon to advertisers; Airbnb aims for business travelers; Didi is huge and getting huger; Uber aims to fly high; free self-driving rides in Phoenix; what freaks people out about robots; the impact of autonomous processes on society; VR is only one letter away from QR, but some are wielding it the same way; United heard the cacophony and has made policy changes; Fyre Festival organizers had a flaming mess on their hands; CMOs need more than marketing savvy; a look at Hanlon's Razor; and more in the You're Fyred edition of The Full Monty. We're sure you subscribe to The Full Monty podcast, and don't forget check out where Brain+Trust is speaking (final section below). ESPN laid off more than 100 employees on Wednesday, including many familiar and highly credible on-air faces. Most observers chalked the moves up to “cord-cutting,” the freefalling relevance of ESPN’s flagship highlight show SportsCenter in a digital world. This challenge extends to other multimedia brands, whether in broadcast or print, in which content is available on any device, and there's a mismatch of attention and big ad spending, combined with an inability to keep up with a rapidly changing media landscape. Mobile and desktop advertising have surpassed TV, and mobile now accounts for more than half of all digital ad revenues, up 22% in 2016 over 2015, according to the IAB. Revenue from digital video is leading the charge, up 53% in 2016 and reaching a record total of $9.1 billion. As TV ad spend declines in favor of digital, it highlights the challenges faced by networks like ESPN. Taking a more "engineering approach" to the future of advertising marketing, WPP purchased Deeplocal, an "innovation studio." A fitting description for a shop rooted in engineering that creates inventions for clients. The future of advertising may be more about experiences than the ads themselves. Consumers want a digital advertising experience that's more subtle, but the question remains about how marketing silos will be broken down to deliver that. Fake news will continue into the foreseeable future for at least four reasons: our media consumption habits have changed; we consider our friends on social media as trustworthy, and therefore not in need of fact-checking; Millennials gravitate to social for news; and they're more open to alternative news sites for information (think Vox, Axios and Quartz, for example — although these are not fake news sites). Social media is polarizing opinions faster than ever. People pick sides, find like-minded users, and dig in. Academics teamed up to dig into the behavior of some 12 million Facebook and YouTube users, and found that within 50 likes of content in a category, users were entrenched. In other news, water is wet. Facebook recognizes that it has a role to play in disinformation campaigns that occur through its platform. They've got a strategy, but it doesn't include a method for combating the creation of false and malicious material at its source, and a sense of Facebook's responsibility when genuine users share those links. Mark Zuckerberg set out to change the world by making it possible for anyone to share anything. But in accomplishing that, the platform has unleashed human nature on itself, making the News Feed the defacto newsfeed to the world, leaving Facebook the unenviable task of trying to fix its own worst bug. Turkish authorities have blocked access to Wikipedia by Turkish citizens. No, you don't get to ask why. And there's no truth to the rumor that this is to pre-empt fake news. 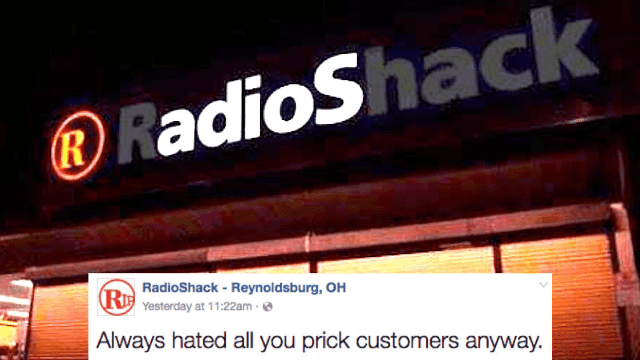 Radio Shack has closed hundreds of stores in the past few years, but none closed quite like the Reynoldsburg, OH location. Businesses with franchisees should consider who has access and control of individual stores or locations’ social media presences. Then again, if you're completely eliminating their livelihood because you mismanaged your entire company, you might just deserve what you've got coming. Jack Dorsey shared some thoughts about Twitter’s growth and the pressure to grow more, the problem of harassment and destructive speech on the platform, whether his company’s done enough to fight it, and of course about Donald Trump. Despite some ongoing controversies, Dorsey does seem to be making positive strides toward halting Twitter’s slide. The platform added nine million users in 4Q 2016, achieved EPS of 11 cents in the same period, beating expectations of only one cent, and saw greater-than-expected revenues of $548 million. It’s too early to declare victory, but these results should provide investors at least a little relief. Twitter is partnering with Bloomberg Media for a 24/7 ad-supported live video news channel, expected to start this fall. Another play for more video ad dollars. Instagram continues its meteoric growth, now topping 700 million active users. Its growth is accelerating, as it added 100 million more users in just four months — significantly faster than it took to jump from 500 million to 600 million or from 400 million to 500 million. Digital advertising rates are likely going up, thanks to Facebook's plan to bring the Facebook Audience Network (FAN) to mobile web pages to challenge Google. Sheryl Sandberg's own willingness to be frank and share her thoughts and experiences is a large part of what drives Facebook's success. WPP is chasing the younger crowd as it commits to some $200 million in advertising with Snapchat in 2017, up from $96 million in 2016. Facebook learned the hard way. As did Instagram. And even Twitter, to much consternation. They all changed their feeds to work with an algorithm to prevent information overload. And fans rewarded them. Snapchat may be held back because of its refusal to do the same. Google is doing its part to combat fake news, rewriting its search rankings to bury fake news and label questionable sources. LinkedIn has reached 500 million users worldwide. That's work-minded users in 200 countries, with approximately 250 monthly active users on mobile. Following Facebook and Twitter, LinkedIn is rolling out Matched Audiences, allowing all LinkedIn advertisers to target ads based on people’s web browsing, their email addresses and their employers. Time spent on the app is up, with the majority of people spending an hour or more a day on it. 57% of users are willing to pay for content on the app. "Miniprograms" within the app still have yet to catch on. Workplace use of WeChat is widespread and may become more codified. Business travelers, rejoice! Airbnb is adding a filter that will allow users to find business-friendly listings. Such listings would include things like amenities, 24-hour check-in, wifi, a desk and at least 60% five-star reviews. Airbnb is fighting racial discrimination by allowing California officials to watch for racist hosts who refuse potential renters in violation of fair housing laws. Chinese ride-hailing service Didi is raising $5 billion, on its way to a $50 billion valuation making it one of China's most valuable companies. Gett has acquired Juno for $200 million — a rival in the New York market. We're surprised no one came up with the obvious headline: Juno Gets Got by Gett. Uber announced that it plans to launch flying cars by 2020. Perhaps this is to take the attention off of accusations of chauvinism at the company; either way, the phrase "when pigs fly" comes to mind. It's now easier to find your rider rating in the Uber app. The company wants to encourage “better” rider behavior. It has yet to do much about the behavior of its own employees, though. Uber announced that it will make it easier for users to access privacy settings and won't require users to contact support if they want to delete their accounts. Lyft drivers are taking legal action against Uber for its "Hell" program that tracked their movements. Uber's head of autonomous driving is stepping aside amid the ongoing Waymo lawsuit. Instead, he'll focus on security and operations. Waymo is giving free self-driving car rides in Phoenix in Chrysler minivans and Lexus SUVs. The company will also be adding 500 vehicles to its fleet, which currently has 100 vehicles. Lexus is also involved in Apple's autonomous vehicle testing. With all of the news of Tesla, Uber, Waymo, and Apple and their autonomous vehicle programs, you might be surprised to learn that it's likely that your first self-driving car may be a Ford. Artificial intelligence will be the business differentiator of the future. From automated communications to drivers of efficiency, there's an opportunity ahead for more personalized experiences. Between autonomous machines and artificial intelligence, what will the impact be on society? Can robots do things better than humans? The inventor of Siri says that one day AI will be used to upload and access our memories. Don't look now, but Black Mirror is slowly but surely coming to life. Speaking of which, robots are becoming more human-like in their approach, and the personalities and psychology we instill in AI will show what we're made of. In fact, Alexa is learning to talk with pauses, whispers and inflections, in order to mimic the human voice. "Alexa, you're freaking me out." 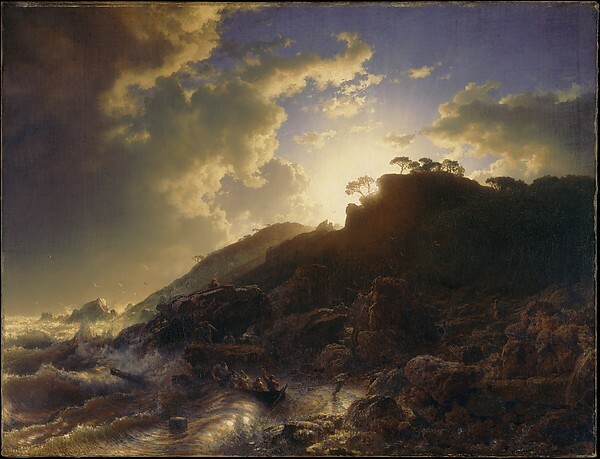 When something as game-changing as artificial intelligence is on the horizon (or here), we're naturally uncertain. A new report shows that humans are scared of robots, but for the wrong reasons. It's generally tied to misunderstanding; for example, they're okay with familiar things like health diagnoses and predictive policing but a little more skittish about the perception of robots taking control of their own volition. How's this for predictive policing? 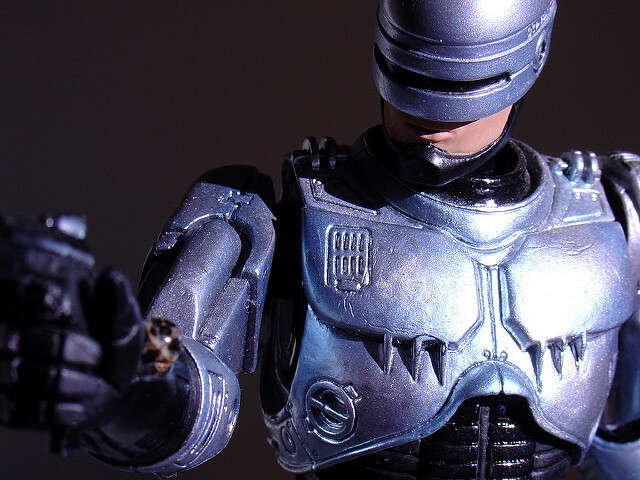 A Silicon Valley company is creating crime-fighting robots that will replace mall cops. And not a moment too soon, as a Silicon Valley man was arrested for fighting with a crime-fighting robot. While drunk. A bar in London has added unnecessary VR components to its cocktail menu. Great. We're getting to the point where companies are going to start using VR like QR codes: just doing it because they can, rather than improving the experience or adding value. SiriusXM acquired connected car company Automatic. Initially, it seems like it might be an odd mix, but SiriusXM has a vested interest in connected cars, since that's where most of its customers listen to the stations. Disclosure: I own shares of Automatic. Musical.ly and Apple are linking up, where Musical.ly users will be able to stream full-length songs — rather than just 15-second clips — from Apple Music's catalog directly within the Musical.ly app, with the further option to save particular songs to their own playlists within Apple Music. Program of the Week: We've got a bevvy of selections this wee: the top 28 marketing podcasts for entrepreneurs. There's plenty to choose from. Do you have a program to recommend? Add yours to our Google Sheet: smonty.co/yourpodcasts. United Airlines announced ten sweeping policy changes, more than two weeks after the now-infamous dragged-off-the-plane incident with Dr. David Dao (with whom United settled this week). The policy changes, announced in an email from embattled CEO Oscar Munoz, include no longer asking law enforcement to remove customers from flights (“unless it is a matter of security or safety”), increasing incentives for rebooking, and no longer asking passengers to give up their seat once seated on the plane. Despite the policy changes -- and Munoz’s apparently candid admission in an AP interview that “I messed up” the initial response and that the Dao incident ‘may sway’ consumers’ airline choices -- many have responded skeptically, pointing out among other things that the airline is only increasing incentives for overbooking, not ending the practice. Regardless of the policies United may put in place, the airline’s issues stem as much from culture as from policy — and culture takes much longer to fix. Stay tuned. The rumors of the death of content curation may well be exaggerated; major media outlets like the New York Times are finding success with curation, so businesses taking a smart and audience-centric approach to curation may also find success. We're just at the beginning of the bull market for content marketing. There's a high demand for marketing skills and executives have a desire for more long-form content. It's possibly the worst event promotion and execution in history, and influencers were involved in it. That's right: it's the great Fyre Festival Fail of 2017. And while it may be reasonable to ask the FTC to get more serious, the real blame lies with the organizers, who are now facing a class action lawsuit from disgruntled rich kids. To the tune of $100,000,000. In a way, Fyre Festival was an amazing success. Instead of entertaining thousands of people, it entertained millions. Hacking reaches the entertainment world, in the form of streaming video: hackers released season 5 of Netflix's Orange is the New Black a month in advance of the official release. Orange is the New Hack? Facebook and Google were victims of a $100 million phishing scam that infiltrated their supply chain. Success as a CMO today requires much more than marketing savvy; it also requires leaders to have functional knowledge and understanding of big data, analytics, and technology. See the AI section above as another reminder. The latest trend for software companies is to create new data-driven discipline for sales teams. Data scientists are applying algorithms to the otherwise intuitive world of corporate sales. The data you voluntarily give up may end up in the hands of a company you don't particularly care for. That's what users of Unroll.me discovered when they were informed that their information was being bought by Uber. The advertising world seems to have a high percentage of people with dyslexia. It turns out that being 'wired differently' may set you up for success in certain fields. The key to surviving a difficult conversation as a manager is to listen more than you talk. You've heard of Occam's Razor, no doubt. Well, Hanlon's Razor can be summed up as: ‘Never attribute to malice that which can be adequately explained by neglect.’ Bottom line: give people the benefit of the doubt if you don't know the full story. "Forgive everyone everything" is one of 50 life lessons from Regina Brett, cancer survivor and author of God Never Blinks. It's always a good idea to find inspiration in successful people. And while you may not have the same opportunities or skills as they do, there's still a way to follow their habits. Here are 7 traits of successful people that require no talent at all.